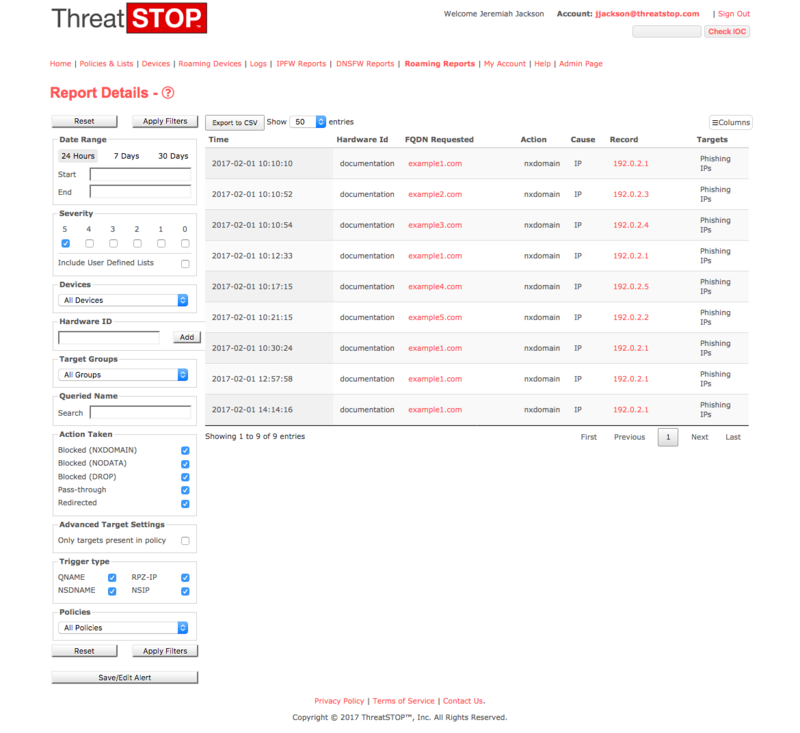 Reporting for ThreatSTOP Roaming Devices focuses on delivering high-quality easily understood reports to Network Administrators and Security Professionals. This allows for rapid evaluation and remediation of threats to a network. The bulk of this process is controlled through a selection of filters that ring down as the user moves through the data. Last 30 Days Custom ranges can also be used by clicking in the Start Date or End Date fields and selecting from a calendar pop-up. Alternatively, the dates and times may be entered in these fields using a MM/DD/YY HH:MM:SS format. Blocked (DROP): Network traffic is that are dropped, with no information provided to the requesting service. Pass-Through: Network traffic is that are allowed to pass through to the requested system. Some reports will also display a Save/Edit email report button below the filter settings. See Email Reports for more information. Number of Machines for each Severity: number of devices that have reported connection attempts in the reporting. 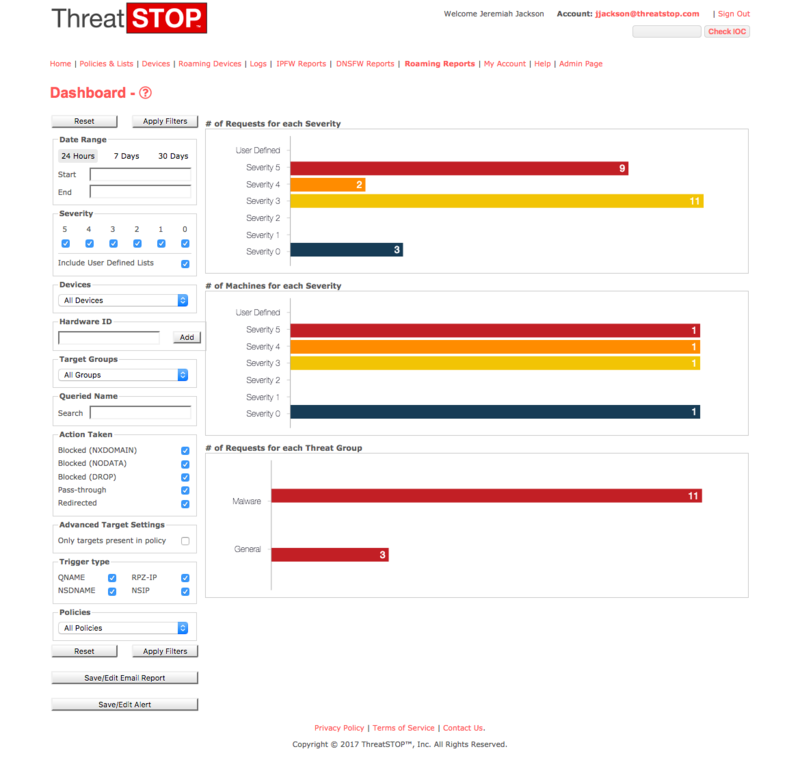 The Threat Summary screen is brought up either by selecting it through the RPZ Reports drop down, or by clicking on a results bar in the Dashboard. 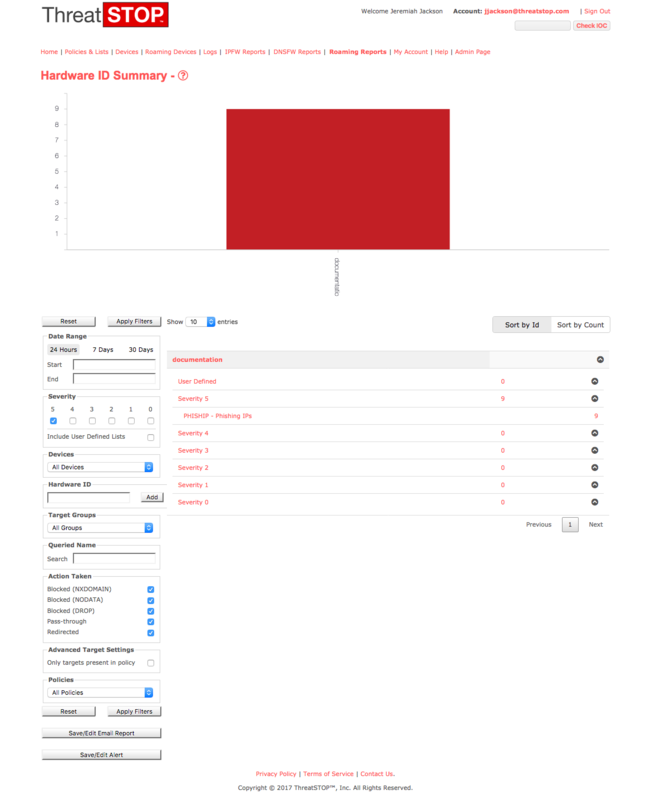 Across the top of the screen a bar graph will appear with a visual representation of the cumulative amount of attacks classed into each Severity level. Target: Threat List entry that has been associated with URI being accessed. In our example a botted computer attempted to access a URI associated with DCNC - BOTNET DOMAINS. The Hardware ID Summary breaks down threats seen by each endpoint. These are then refined by severity level, cumulative communications for that severity level, then by the Target type and number of communication attempts for each target type. The bar graph at top shows threats by severity in least-to-worst order. That is, severity zero threats are always displayed on top, and severity five threats are always displayed on the bottom. The listed breakout is displayed in an identical fashion. 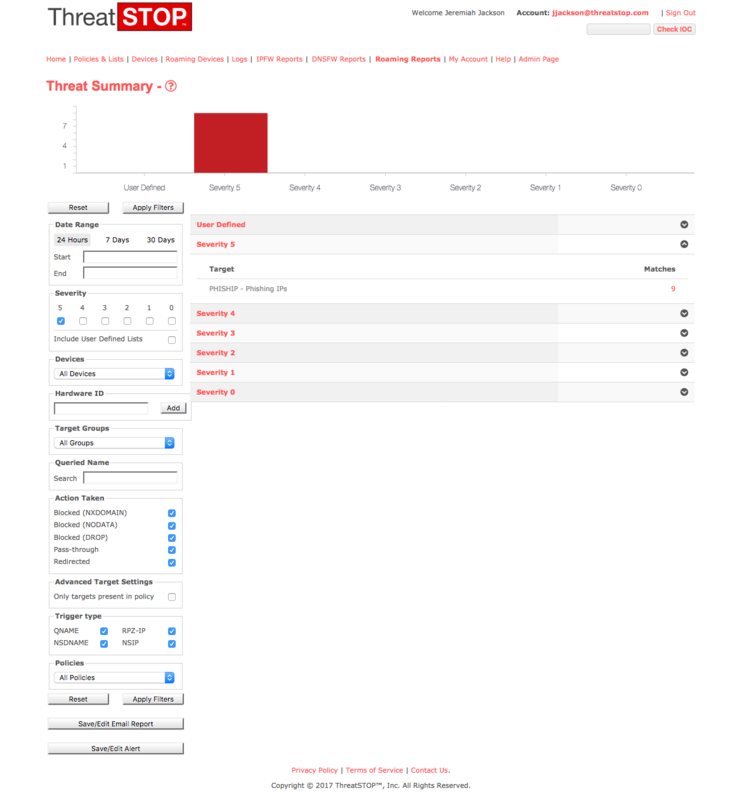 Clicking on a given severity will display the Report Details screen, for only the threats in that severity level. Clicking a threat will display all entries for attempts to connect to threats in the given target. Hardware ID: listing for the device that made the request. This device will have attempted to communicate with a FQDN in the target list. The reports themselves contain the following data: A time stamp showing the date and time a communication was made. This is up to the nearest hour in the case of hourly reports. Below this the returned values are processed out by severity level and number of connection attempts for that severity. This report returns the 20 most frequently detected IOCs for the selected time period. The bar graph at top is sorted by the most frequently encountered IOCs, descending from left to right. The report is broken down by IOC, threat severity and threat target. The results can then be drilled down into which will bring up the Hardware ID Summary report (described above), allowing the individual devices that have made these communication attempts to be viewed. Client IP: IP Address of the Client that made the FQDN request. Devices listed here should be taken down for remediation as soon as possible. This is a default setting. QNAME: The FQDN is listed in an RPZ threat list. IP: The IP address associated with the domain is known to host malicious attacks. Record: Contains the FQDN, or IP address that the client device attempted to reach. Individual Detail Report entries can be investigated using the Check IOC utility by clicking on the Domain Name, or IP address associated with the threat.